I admit, I’ve only ever taken one spin class. You know, that indoor cycling thing where the instructor tells you to up your bike’s resistance, stand up, pedal harder, etc? 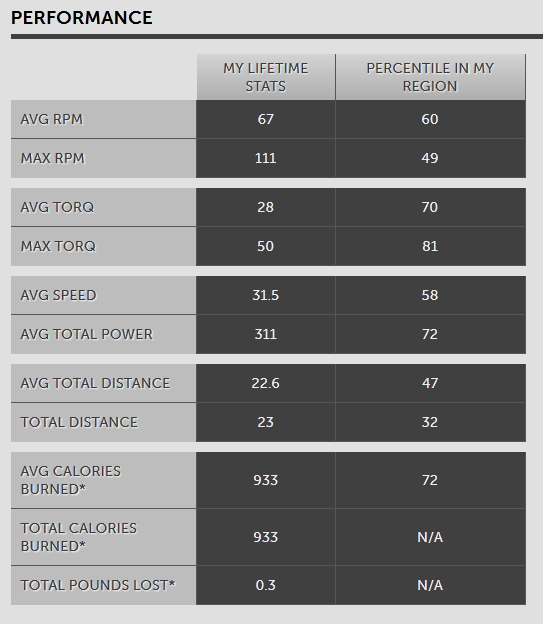 However, since I’ve been running less I’ve really been getting into cycling more. And when I heard about Flywheel from three people in one week I knew I had to check it out. The Chicago Flywheel is located just off the Chicago Red Line Stop at 710 N State Street. Super easy to get to if you work downtown. 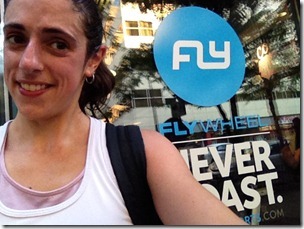 So, how does Flywheel differ from a regular spin class? Here are five reasons. 1. You can see how hard you’re working. 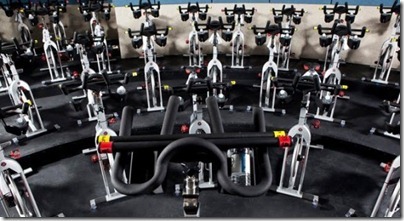 Each bike has a knob on it, just like on a regular spin bike. 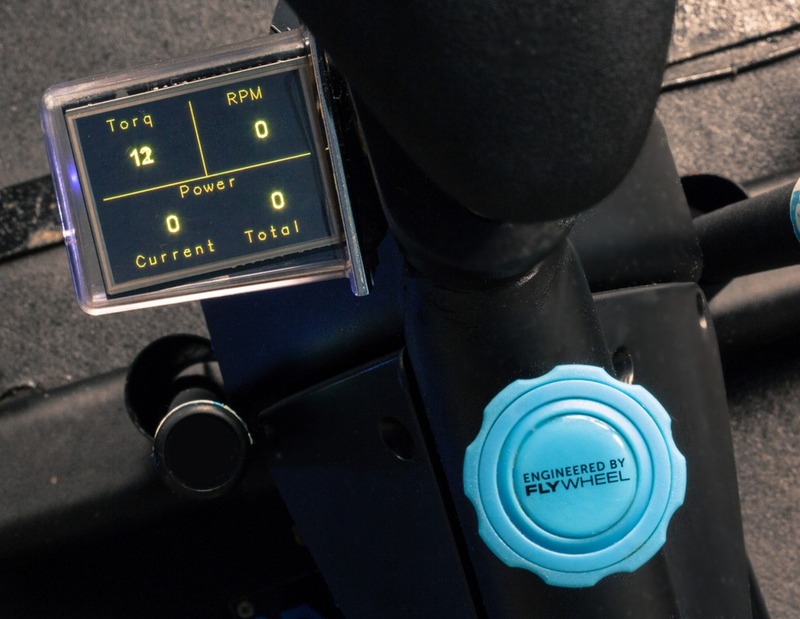 But this knob is hooked up to a computer on the bike that shows you numbers associated with your resistance (“Torq”), your RPMs and two other numbers that you can use to gauge yourself against the other people in the class. 2. Each bike has two weighted bars stored on it. 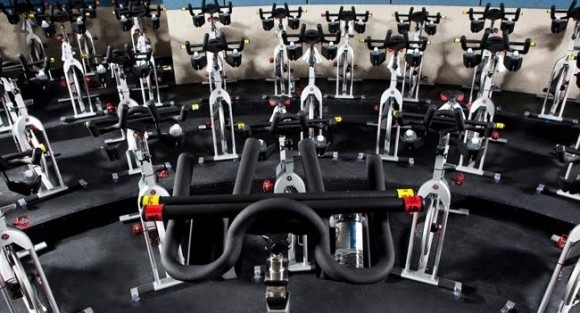 For at least one song per 45 or 60 minute class the instructor has you pedal at a certain RPM while doing arm and upper-body strength moves with the weighted bar. You can choose between a 4 pound or a 2 pound bar or hold them both for 6 pounds. That doesn’t sound like much but after 5 straight minutes of shoulder presses, bicep curls, and rows your arms will be screaming. 3. You reserve your bike in advance. No more worries about making sure you get to class early enough to snag a bike. When you sign up online for your Flywheel class you pick your bike ahead of time. 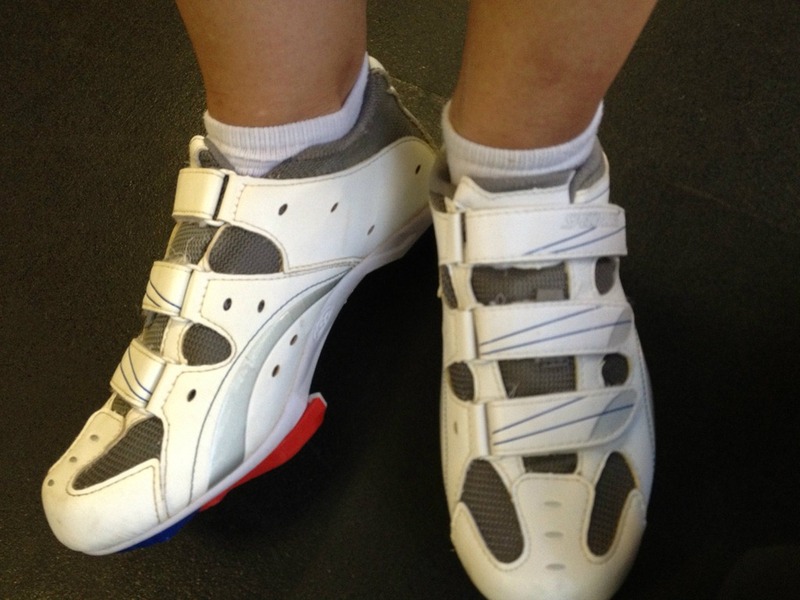 When you arrive at the studio you just log-in, grab your shoes, and hop on your bike. 4. Speaking of shoes, they provide them. Always wanted to try cycling with a pair of shoes that clip into the bike pedals? Flywheel has you covered. When you sign up for a class you enter your shoe size and they have them set out for you in a cubby with your bike number on it. They are included in the price of the class! Don’t know how to clip into the pedals? No worries. Each class has at least two employees that go around at the beginning to make sure everyone’s bike is the right size and that they can get clipped in okay. They also provide towels, lockers, water, and bananas in the price of the class. 5. If you like numbers this is the place for you. Not only do you get the immediate numbers on your bike, you also get to see how you’re doing compared to everyone else in the class. At the front of the stadium-seating-style room there are two screens that show everyone’s name who opted into the “Torq Board”. The screen displays your name, your bike number and your “Power” total. At the end of the class is shows how you ranked against everyone else. You can opt out of this if you don’t care about a little competition, though. The other numbers they give you? An entire spread of them afterward! After class they send you an email with a link to check out your stats from the most recent class as well as every class you’ve attended. This is an amazing way to gauge your fitness over time if you attend Flywheel classes on a regular basis. So, what did I think? This is one heck of a workout. I was so drenched in sweat that I don’t think there was a dry spot on my body. I loved that I could see my intensity without doing any guesswork. The instructor played great music and he had some high energy. The only downside was that I didn’t know some of the lingo so I wasn’t always sure what the instructor was asking us to do. But since you can easily see the instructor because of the stadium seating and the spotlight on him or her I just tried my best to do the same thing he was doing. The best part? The first class is FREE! Of course, after that each class is $25 or slightly less if you buy them in bulk. I don’t expect I’ll be making this a regular thing but as an occasional splurge this winter when I want to push myself on the bike? Pretty sure I’ll be there.